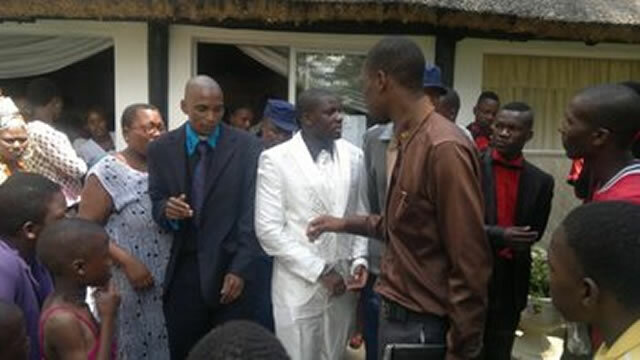 This picture shows would-be groom Movern Madhende being handcuffed by the police in front of the wedding party in Gweru on Saturday and being led away to the police cells. THE planned wedding of a South Africa-based couple was called off in Gweru on Saturday when the groom was led away in handcuffs, while the bride fainted when the groom’s ex-wife from Mutare pitched up with a two-year-old boy in tow.It was apparently the first time the bride had heard that she was marrying a divorcee. The drama unfolded at Mpumalanga Lodge in Gweru at around 11am on Saturday where Movern Madhende was set to wed Miss Rejoice Munike of Mkoba high-density suburb. The wedding was abandoned after Madhende’s wife, Ms Rumbidzai Chipuma of ZIMTA Park in Mutare, showed up at the wedding and objected to it before the preacher could lead the couple through their vows. Ms Chipuma then called the police and the groom was subsequently arrested for defaulting on paying maintenance amounting to US$1 800 for the upkeep of his son. When The Herald news crew arrived at the scene, the bride was being resuscitated after she fainted on realising that her husband-to-be had a child and had been married. Ms Chipuma said she had come all the way from Mutare after getting wind that Madhende was getting married after he had abandoned her with the baby for South Africa. She claimed that Madhende had abandoned her and the child and had also defaulted paying maintenance for 18 months. Ms Chipuma was also in possession of a court order for the arrest of Madhende for defaulting on maintenance. “I had a child with Madhende in 2011 and went to my parents where he formalised our marriage and committed himself to come back with the lobola. He then left for South Africa to look for employment,” she said. Ms Chipuma said she later took Madhende to court after he failed to show any commitment to pay the bride price. “After my parents died, Madhende abandoned me and the child. I then took him to court in July 2011 where the court ordered him to pay US$100 per month as maintenance. He paid for a few months before defaulting,” Ms Chipuma said. “He has defaulted for over 18 months. I then went back to court where I was given papers so that he could be arrested. When I heard of the wedding, I came to Gweru and tried to engage him the day before but to no avail. I then reported the matter to the police,” she said. Madhende refused to speak to the Press. “I have nothing to say,” he said. Madhende’s brother Sam confirmed that his brother had a child with Ms Chipuma and the two had been fighting over the upkeep of the child. “We want to resolve the matter amicably. We can commit ourselves to sell our cattle so that we raise the required amount,” he said. Midlands police spokesperson Inspector Emmanuel Mahoko confirmed Madhende’s arrest.